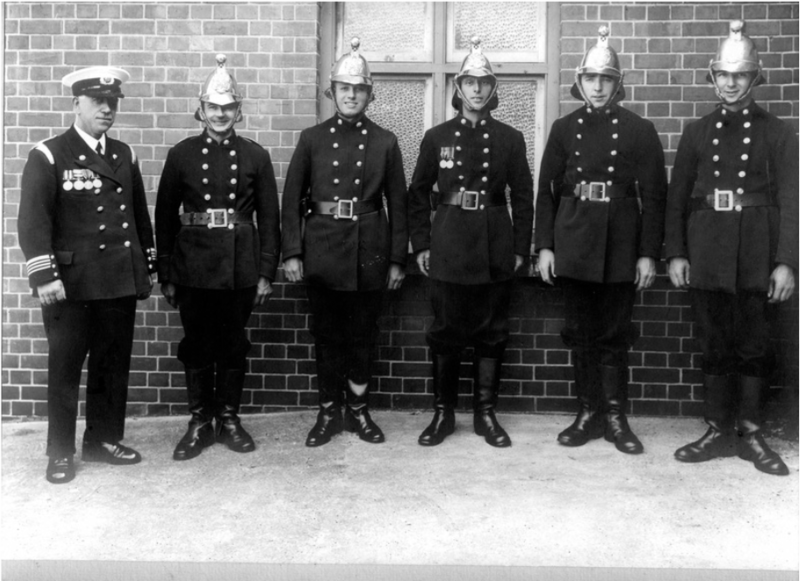 Pre War Photograph of Newton Abbot Firefighters. (picture was taken at the cattle market. 8th October 1957 Ashburton College Blaze, Courtenay Road Newton Abbot. 34 boys and staff members filed out into the night to safety after being told that the building was ablaze.None of the boys or staff was injured in the outbreak which destroyed wood-constructed classrooms seperated from the main building.The flames leaping 30 ft into the air caught fire to the roof of a new wing and classrooms beneath were damaged by fire heat and water. A fireman was overcome by pungent smoke during the height of the fire he was a Newton Abbot man William Bailey who was taken to the local hospital by car for treatment.The Newton Abbot Brigade received the call at 05:00 and in quick time three appliances including one from Torquay were fighting the fierce blaze which could be seen for miles around. Firefighters were still at work at noon turning over smouldering debris and damping down. Fire Chiefs directing operations were assistant Chief Fire Officer A Hart; Area District Officer W.Potter; and District Officer E A Kirby. 21st January 1961 Hundreds of passers-by crowded the Drum Clock corner at Newton Abbot on Saturday to watch firemen of two brigades tackle a blaze which shot up through two floors of Pearks Dairies shop in Queen Street. The fire started in a bacon room and within minutes flames were roaring through stock rooms bottles were exploding and glass was flying everywhere. Staff escaped from an upper window at the back of the building onto a flat roof and down a wall into a back yard. Two fire engines from the Newton Abbot station travelled just over 200 yds away as two other machines raced from Torquay. Fears for the safety of the adjoining buildings were dispelled within an hour as the blaze was brought under control, but firemen stayed on the scene for more than five hours. Here is a newspaper cutting from the mid 1960's showing the site of the current station at the junction of balls corner, The Cooling tower in the background and the (Central Electric Generating Board) generating station was demolished in 1974. 1972 The Opening of The Current Station. Station Officer Derek Packer introduces Mrs F N Humpherson to the Firefighters, from left Leading Firefighter George Smith,Leading Firefighter Ken Lancaster,Leading Firefighter Sam Hewings,Sub Officer William Bailey, and Station Officer Jack Collier. F/m Robert Bailey, F/m Gary Burgess F/m Anthony Winsor, F/m Pete Gribbon, F/m Colin Stocker, F/m Jock Anderson. Long Service Medal Presentation 1976. Station Officer Derek Packer (Left) and Sub Officer William Bailey (Right) at the presentation ceremony have received good conduct and long service medals. (20 years) The Presentation was at the Devon Fire Brigade recruits passing out parade held at the Brigade Training School Plympton.